Ranching is a common way of life when it comes to many native Montanans. From the Bitterroot Mountains all the way to the badlands of eastern Montana, the economy thrives on agriculture and hard work. With all of the hours of tedious work that Montanans put in, occasionally they need to let loose and have a little fun. Whether this be a backyard barbecue, a day at the lake, or an evening concert, Montanans are always up for a good time. 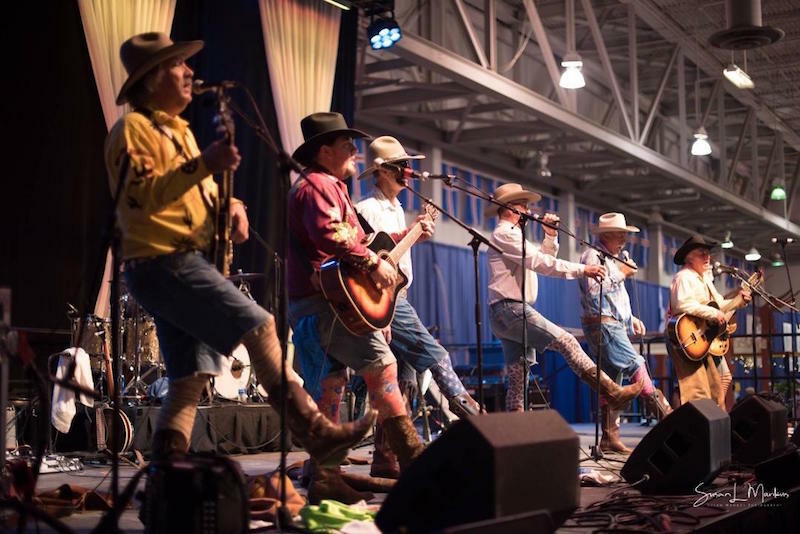 Located in Wilsall, Montana, is a group of six musicians (Ken Arthun, Les Arthun, Chuck Dallas, Don Seifert, Larry Lovely, and Don “Obie” Oberquell) who know how to get the good times rolling. They found a way to perfectly depict the lifestyle of Montana’s ranchers and outdoorsmen through song. Their experiences as ranchers themselves give them insight and understanding to relate to the agricultural community. The band adds a humorous spin to the serious events and challenges that Montana’s rural community is faced with. They call themselves The Ringling 5. The band got their name from the small town of Ringling, just west of Wilsall. When asked about the origin of their name, Ken says that originally they were going to call themselves the “Norwegian Studs of Rhythm.” After much consideration though, they decided that every town needs something named after it, and since they grew up around that area, it was only fitting to use the name Ringling. In the band’s early years, the group started out with only five members, which is how they came to be the Ringling 5. The band members all developed an adoration of music from a young age. Individually, most of them acquired their appreciation for music from their high school music teacher, Mrs. Blin. Ken tells of her: “She had very high standards, so the high school music program always got really good ratings. She was something else.” He says that she was the reason he learned to love music. They also had other influences as well though. Obie informs me that his father had been a musician, so growing up around his father and his friends, he naturally picked up a passion for music. I think it’s safe to say that the band’s love affair with music that started from a young age hasn’t changed since. Following high school, most of the band members went away to college, where Larry and Don started their own band back in 1968. “It was the Sixties, so we were playing a lot of rock ‘n’ roll,” Larry says. “The first song I learned was ‘Eve of Destruction.’” Upon graduation though, they came back to their small town of Wilsall and started playing music together, which is when the Ringling 5 was born. Today the Ringling 5 have traveled all over the country to perform. They have been everywhere from New York to Florida and even Canada, including many concerts right here in Montana. They told me about a festival they have played for the last sixteen years in North Dakota. It typically brings in crowds of up to 90,000 people. The Ringling 5 is very unique, not only in the songs they sing, but also in the instruments that they play. They don’t stick to the typical guitar, bass, and drums. Although they do incorporate these instruments in their act, they also add some much more unconventional instruments into the mix. They play things like harmonica, mandolin, sousaphone, banjo, and accordion, and many of the band members play more than one instrument. Don says that he has been playing bass, guitar, banjo, and accordion since he was eleven years old. Obie also plays a unique mix of instruments. He plays harmonica, base, lead guitar, and a very unique 1907 four-valve sousaphone. They all have a very extensive history consisting of multiple instruments along with vocals. Their wide range of experience is part of what makes them great musicians. Over the years of playing together, the group recalls many unforgettable memories. When asked about the most exciting event they have experienced at one of their concerts, Larry, Les, and Don all three have the same occurrence come to mind. They say they saw a man in a wheelchair sitting in the front row at one of their concerts in Big Timber. After the show, they started talking to him and his wife. The couple was from Oregon. In the recent past, the man had been in a coma for quite some time. During the time he was in the hospital, his wife attended a Ringling 5 concert and bought one of their CDs. She took it back home with her to Oregon and played it for her husband in the hospital. While the CD was playing, the man awoke from his coma. The couple said that this miraculous event compelled them to come back and see another show. The entire band agrees that it is a blessing to be able to touch peoples’ lives in such an intimate way, all while doing what they love. The Ringling 5 is a band unlike any other. The laid-back nature of these six musicians makes them truly unique and sets them apart from other bands. They agree that one thing that makes them different than a lot of other bands is that there has never been much drama between the group. “We’ve had little disagreements here and there, but nothing big,” Les says. “Maybe it’s because we all have busy lives, so when we are together, we just have fun.” Ken emphasizes, “We never let egos get in the way of friendship,” and Obie adds, “Even after all these years, when we’re on stage, we can still laugh at each other.” He says he feels “truly blessed to be a part of this group.” I like to think this comes from their Montana roots and their passion for doing what they love. While pursuing their shared love of music, they never let themselves get too far away from their ranching lifestyles, which they agree has kept them humble and focused through the years.